"You've hurt yourself....the precious blood." 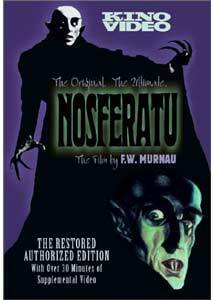 It's amusing and slightly ironic to note that this new edition of Nosferatu (at least the seventh such on DVD by my count) states that it is the authorized version of the film, copyright 1922. It did, after all, have its origins in blatant copyright piracy itself, being an unauthorized adaptation of Bram Stoker's Dracula. Stoker's widow sued, won, and all copies of the film were ordered destroyed. Thankfully, that task was unsuccessful, largely due to the fact that numerous prints had already been exported. What this version has over the six or so others is a small amount of additional footage culled from a variety of prints (including a sound reissue that had access to Murnau's outtakes). This version uses Murnau's original names, instead of the names from the Stoker novel that appear in most public domain releases (the Image disc also uses Murnau's names). Young solicitor Hutter (Gustav van Wangenheim) is sent by his employer, Knock (Alexander Granach) to the castle of Count Orlok (Max Schreck) in Varna to seal a real estate deal for the abandoned house across from Hutter's own. Once there, the Count completes the purchase, but makes Hutter a prisoner. Too late, Hutter discovers that his host is vampire sleeping in a coffin, and that he has designs on Hutter's wife Ellen (Greta Schroeder). Soon a ship of death is sailing for Wisborg, as the Count feeds on the crew one by one, driving them to delirium, ready for a land full of new blood. Parts of the film seem silly or antiquated today, but there is an undeniable power to Schreck's Count Orlok. Loathsome to an extreme, this first cinematic vampire is still the most vile to look at, despite many efforts to surpass it. His odd, scuttling movements, make him seem not human or even vertebrate, but more like a man-shaped tarantula. Greta Schroeder is appropriately winsome, and certainly attractive. One has little doubt why she fascinates the Count so. She has a few good sequences, particularly as she is sleepwalking, summoned by the Count's will. Von Wangenheim far overplays his essentially comic role; the whole would have been much better if he had underplayed a bit or been a shade more naturalistic. However, once he's at the Count's mercy the somewhat bigger movements and reactions are fully appropriate. This disc runs nearly nine minutes longer than the revised Image disc. While both seem to be running at about the same frame rate (not at sound speed, thankfully), the Kino version spends longer on the intertitles, the text of which can be lengthy. They're set in an old English type that can be difficult to read, so the extra time is appropriate for first-timers. The added footage doesn't add up to a great deal, I'm afraid. During Hutter's coach ride to the castle, there are additional insert shots (which may or may not have been done under Murnau's supervision) of landscape. As Orlok's coffins are being rafted to the ship, there is an additional shot of the raft going by. As they're being loaded onto the ship, there's an additional bit of business where we see the bill of lading and learn the ship's destination and name. The lengthiest addition comes as Ellen sits at the dunes waiting for Hutter's return. An added sequence of Harding and his sister Ruth playing croquet appears here, interrupted by the delivery of the letter from Hutter. They run to Ellen, and the action resumes as in the familiar print. Towards the end, Ellen reads at greater length in the book on vampires, making her actions in the finale a bit more clear to the viewer. Several other shots are somewhat longer as well; for instance, the famous shot of the doomed ship coming towards the camera is much longer in this edition, and there are a few additional intertitles as well as slightly different editing. Oddly, the bearings of the ship and the wind in the captain's log are different in this edition and the Image one. In this edition the original five-act structure is retained; in no other does that occur. The additional footage adds little, really, though the logic is a bit clearer from the added segments involving Ellen. I would suspect that much of this added material was cut by Murnau himself in order to improve the pacing. However, it's certainly nice to see it here. Image Transfer Review: While the source material has excellent detail and contrast, with fine grey shadings, it does suffer from a good deal of scratching. However, it's still miles ahead of the usual public domain version of this film. One thing that is always a serious issue with this film is cropping; often significant detail goes right to the edge of the screen. For most of its length, the Image disc has slightly more generous framing than this one, with small amounts being cropped off various sides. For instance, when Hutter discovers the Count in his crypt, in this Kino edition he briefly steps out of frame to the left; he does not do so on the Image disc. However, there are several instances of looser framing on the Kino disc, and they all occur at vital moments. The chiming skeleton clock on Orlok's mantle is completely present here, though it is almost always cropped off of other releases. Orlok's death scene is a more complete tableau than one ordinarily sees. And most importantly, the money shot when Orlok rises bolt upright out of his coffin on the ship, is finally presented properly on video. Most of the time his head is completely cut off or bisected; even on the Image disc he loses the top of his head. But here, happily, his entire head fits on the screen as it should, with a little bit of clearance to spare! This shot has irritated me like no other in cinema in its video incarnations, and I'm delighted to finally have it done right. It's a small change, but a vital one that keeps the sequence from being comic and keeps the utter chilling horror that it should have. Other versions (Elite, Madacy, etc.) are much more severe in their cropping, often cutting the climax offscreen! They are to be avoided, since they are murky and blurry, not to mention they also tend to run at a ridiculously fast sound speed. Audio Transfer Review: Two music tracks are supplied. One by Donald Sosin, features synthesizer, pan pipes and a woman's voice, with cheesy cries and gasping for Ellen as she dreams of dark things. The other, by G�rard Hourbette and Thierry Zaboitzeff, is more atmospheric, with wind effects and occasional industral noises, and isn't terribly musical. The film works quite well with either score, so the viewer really can't go wrong here. Sound quality is very good, without noticeable hiss or noise. An ample soundstage is provided, with extremely broad range and depth of field. Extras Review: An interesti        ng array of extras is included. First up is about half an hour of excerpts from six other films directed by F.W. Murnau: Journey into the Night (1920), The Haunted Castle (1921), Phantom (1922), The Last Laugh, Faust (1926) and his last film, Tabu (1931). Through these excerpts ones can see a consistent style, particularly in Murnau's use of shadow and buildings. His fondness for double exposures and optical tricks is also revealed, notably in Phantom, which prefigures his Oscar®-winning Sunrise (1927). A comparison of Harker/Hutter's meeting of the count and first meal is also provided, covering the original novel, Henrik Galeen's screenplay for Nosferatu, a clip from the film itself, and (unbilled on the package) Orson Welles' Mercury Theatre radio dramatization of Dracula from July 1938. This is mildly interesting, but interpretation is left entirely to the viewer. Rounding out the package are about 18 stills and publicity shots. There are trailers hidden as easter eggs on this disc for Dracula (1931), Mark of the Vampire(1935), Dracula, Prince of Darkness (1965), Nosferatu (1979). While the case bills it as the "Ultimate" Nosferatu the situation is not quite so clearcut. The Image source print is in better condition, but this version has less cropping in two key sequences. There is additional footage found nowhere else, but it's not exactly revelatory. The extras are completely different, so the devotee could happily own both the Kino and the Image discs.